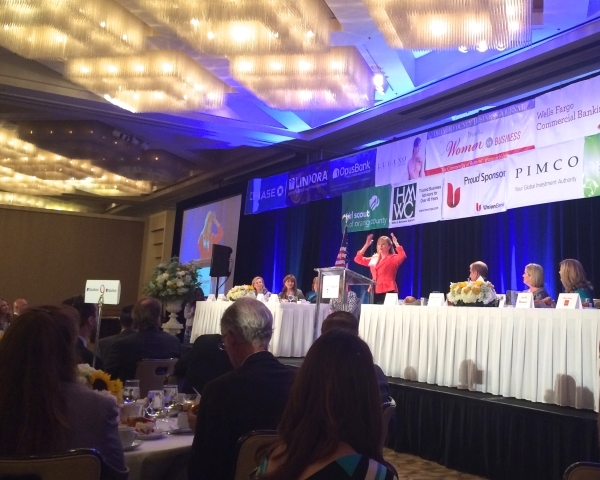 When I recently attended the Orange County Business Journal Women in Business Awards, I expected to be inspired. As one of the judges for this year’s competition, I had already reviewed the nominations of 214 remarkable women. I struggled to narrow my selections down to a “top ten,” and when I saw the secret list of the five honorees, I knew each of them would have something fascinating to share. I also expected that Lindsey Ueberroth, president and CEO of Preferred Hotel Group, would deliver a great keynote speech—and she did. She shared a story about how her doctor once “grounded” her and ordered her to not travel for six weeks in order to avoid total burnout. She had been pushing too hard and doing too much for too long, and it was taking a toll on her health. During the break from her intense work and travel schedule, she came to realize how essential it is to achieve balance in her life. It was ironic that one of the honorees missed Lindsey’s speech—and nearly missed her own award presentation—because she found herself in the position of trying do it all. It seems her daughter’s promotion from grade school was scheduled for that morning, and she was literally running into the ballroom as her introduction was being read. Her award was to have been the third of five presented, but when the organizers realized she hadn’t yet arrived, they moved her presentation to the end of the event—and she still almost missed it! No matter how hard we try, there are times when we simply can’t do it all. As motivational and uplifting as the event was, what I found every bit as inspiring was a spontaneous conversation I had with a woman I met during the pre-event reception. She happened to see my name badge and introduced herself. She explained that one year ago, as she was getting dressed to attend the same “Women in Business Awards” event, she stood in front of her mirror and cried. She said she felt fat, frustrated, and unattractive in every outfit she tried on. That experience was a turning point that motivated her to begin the Lean for Life program. She has since lost 25 pounds and is looking healthy, happy and confident. There were 1,000 people attending the event, and yet somehow our paths crossed. It was a brief conversation, but it made my day. As she told me how grateful she was for the work we do and how terrific she feels, it reminded me that while it’s extremely rewarding to be acknowledged by our peers, sometimes the greatest reward is the satisfaction we feel when we set a personal goal, create a plan of action, follow through and make it happen. Five women left the hotel ballroom that afternoon with an award, but I’m betting the woman who shared her weight loss success story with me felt every bit as victorious.